Can you tell if he dyes his hair or not? 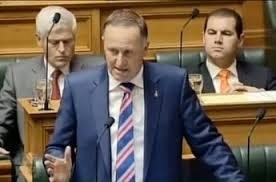 John Key: shouty John demonstrated everything that is wrong about the debating chamber with his kindergarten like behaviour and loose version of the facts. His name calling of Andrew Little was pathetic at best, but to claim that National is the best manager of the economy was a joke considering Bill English has not posted one surplus and our overseas debt has ballooned since National occupied the Treasury Benches in November 2008. He did go on to outline his intended work for 2015, specifically mentioning the RMA, ISIS, housing, social welfare and education. Key - do you think he will last? 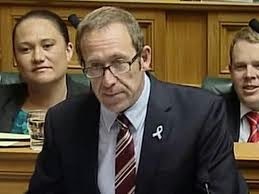 Andrew Little: some critics like to call him "Angry Andy", but I saw passion yesterday afternoon. His use of repetition to drive home points was was evident, especially continually referring to Mr Key and Steven Joyce as the "Masters of the Universe" due to their negotiations of the Sky City Convention Centre. His attack over the Sabin issue was marred by the interruptions of David Carter, the most inept Speaker ever, who kept warning parliament of his ruling despite Andrew sticking to the ruling. When this issue came up with other MPs speaking, the stand in Speakers were not so jumpy. Andrew spoke of the difficulties first home buyers face, that small business needs to be focused on and the fact that many of middle NZ do not find themselves better off under this government. Russel Norman: he spoke in even tones. His speech was sensible and stacked with statistics, focused firstly on climate change and then inequity and child poverty. I'm disappointed he has decided to leave parliament during this term. He has added to the texture of the place that made it a better place. He may be 70, but you can't count Winston out yet. 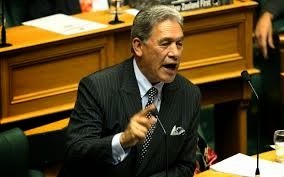 Winston Peters: the newspapers focused on Winston accusing Mr Key of losing and dying his hair, but failed to mention all the other points of his speech in regards to ISIS, the RMA, or the really funny taunting of Gerry Brownlee. Can anyone explain what's going on between Winston and Gerry currently? Marama Fox: as Te Ururoa Flavell was paying his respects to Ngati Porou elder and scholar Apirana Mahuika, the job fell to Marama, the new co-leader. While the Maori Party is a part of the Key led government, Marama was not above pointing out where the government was failing in regards to social policy, housing, child poverty and health for low socioeconomic families, Maori and Pacific Islanders in particular. Peter Dunne: this was interesting because there were three key issues that this member of the Key led government also differed greatly with his Prime Minister. The RMA, approach towards dealing with ISIS and the review of our security departments (GCSB/SIS) all were shown to be issues where they will differ. Then later in the night he went onto vote in favour of the disastrous Education Act amendments (which blotted his copy book in my opinion). So young. What will parliament do to him? 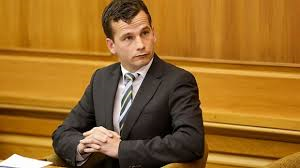 Despite David Seymour speaking before Dunne, I've saved him for last because he is the subject of my ire today. Firstly he made a few digs about Winston Peters' age and attempted to rebutt Winston-Salem question "Is the country heading in the right direction? " Then David explained why ACT would be supporting the government's plans to change the RMA. He warbled on about how it should all be based on science - physics, biology and chemistry to be precise. I think he was inferring that taniwha, history and spiritual connections to the land should be ignored. Now let's get some perspective about David and the RMA. David was born in 1983, the RMA came into service in 1991, so David was 8 years old. Just to put it in perspective as far as I fit in, I was in 7th form. I know David is an educated man because he has a Bachelor of Engineering (Electrical and Electronic) and a Bachelor of Arts (Philosophy) which are not easy degrees to get, so he is rather a smart cookie, and David has worked in policy analysis before becoming John Bank's right hand man to get charter schools (aka partnership schools) installed in New Zealand. But my point here is, all the theory in the world means diddly squat when you put that up against people's real lives and the impact of these RMA changes. David doesn't get the history, the ethos behind Simon Upton's original philosophy behind the RMA and what it was like trying to build or develop prior to 1991. He doesn't get how this legislation has protected many aspects of our society and environment in the last 23 years. While I was still at school myself at the time, my dad has stories about how easy it was to do things in one county council, but impossible to do in the next, a mere few kilometres away. One thing the RMA did was level things out no matter where you were. David thinks that by focusing on science the RMA will open up land for development to build houses. What he fails to realize is one of the biggest issues blocking houses being built is land banking and I believe any changes to the RMA will increase that issue. But let's move on to what really got my goat - David's comments on education. First he started talking about the establishment of charter - sorry - partnership schools. He claimed that they were performing off the charts (what about that one outside of Whangarei David?) and that student numbers were up (I'm picking that's only because more schools opened this year). He then went onto bash the PPTA for their opposition along with Tracey Martin from New Zealand First. He claimed that there was a momentum building for these schools, that it is diverse. And then David said that the ACT party was doing what Labour wasn't, carrying on Peter Fraser's vision from 1949 - but I'm pretty sure his vision was about quality public education, not a separatist system! David: "...if the member really cares about delivering the promise that every the child will be developed to the full extent of their powers of our education system then we must be able to let in new methods. And I actually agree with one of the things that Eleanor Catton said. She said that when you have success too many people are there to beat up on you unless they can collectivise it for themselves. Imagine a world in which the approach of the teacher unions, in which the approach of the opposition, in which the approach of even Tracey Martin, was such that we admired people who have taken risks, gone out on a limb, been creative, enrolled their kids in order to find ways to adrdress one of New Zealand's most urgent problems. Wouldn't it be nice, wouldn't it be nice to live in a country where Eleanor Catton's concern of tall poppy syndrome was addressed and we could actually try new things to make kids lives better without such negative wailing from all over the chamber." Imagine a world where the education establishment and political opposition are focused on what is best for our kids and actually welcome this policy as an opportunity for New Zealand’s children. They have every right to question the details of the policy in a constructive way. But imagine them celebrating the schools’ successes, admiring the men and woman going out on a limb to operate the schools, and respecting the choices of the families and children who enrol at them. Sad that we have to imagine it. I concede that he didn't actually say that teachers are not innovative, that we don't take risks, that we don't care. But I stand by the insinuations I could hear made as he attacked the motives of the teacher unions, NZEI and PPTA, because these organisation's are member driven, so when you out attack them, you attack teachers and principals of all the sectors and support staff too. This was something Dr Nick Smith found to his detriment at the 1999 NZEI Annual Meeting when he insulted the then NZEI President, Daryl Ward, in front of the whole meeting. Anne Tolley and Hekia Parata a have also found the same (Hekia hasn't attended the last two years). And nothing screams more that he as an ACT MP, as well as all those National party MPs, voted later that night (along with Peter Dunne) to pass the third reading of the Education Act amendments - the same amendments where more than 90% of submissions opposed the abolition of the Teachers Council to found EDUCANZ and the changes to the make up of governing bodies of universities. So if you read the above tweets, you will see I put out a challenge to David Seymour. I challenged him to repeat his statements in any school staff room in the country. I told him I'd like to be there when he does it. I would hope he would do it in a staff room for each education sector: ECE, primary, secondary and tertiary to see the response. 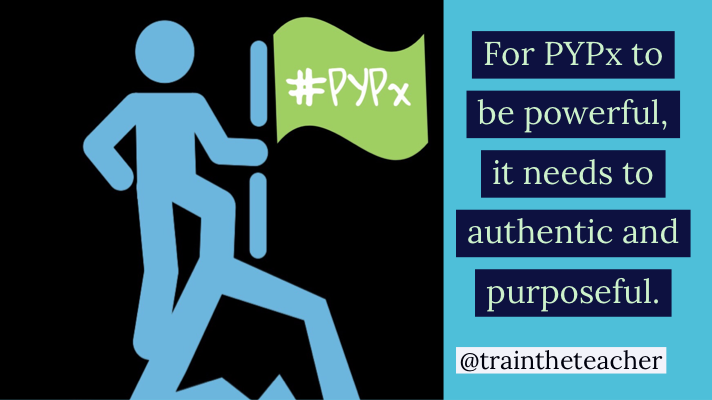 I also invited him to participate in and #edchatNZ session on Twitter. I wonder what will happen. I do quite enjoy the engagement of debate with him, but I know I should be wary because he is a smart cookie after all!